Explanation: Today the Sun reaches its southernmost point in planet Earth's sky at 13:37 UT. This celestial event is known as a solstice, marking the beginning of Summer in the Southern Hemisphere and Winter in the North. But this year, the solstice will be followed, on December 25th, by another geocentric celestial event -- the last eclipse of the millennium! The Christmas day eclipse will only be a partial one as the silhouetted disk of the Moon obscures the Sun's edge. 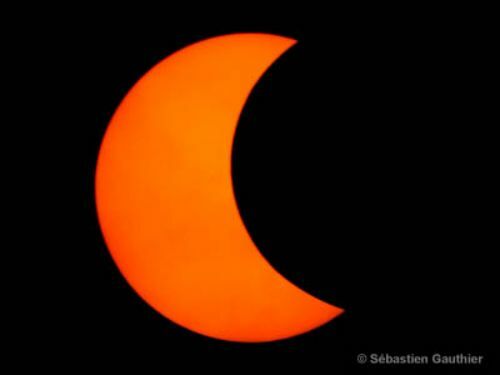 Visible from much of Canada, The United States and Mexico, the appearance of the partially eclipsed Sun might remind you of the last holiday cookie you took a bite from. Still, the exact timing and degree of the eclipse will depend very much on your location. This image, from an annular eclipse in 1994, shows the lunar disk covering around 55% of the Sun's diameter. It is representative of what could be seen from Washington D. C. during the December 25 eclipse maximum which, for that location, occurs at 12:41 PM ET. As always, if you view the eclipse be extremely careful to protect your eyes.